I’ll admit it, the first thing that attracted me to Rich was his library. And soon enough, his Nabakov, David Foster Wallace, and Thomas Pynchon were mixed in with my Tom Robbins, Philip Roth and cookbooks. And there our books sat, pretty much untouched by the other, for years. Every so often I would pick up a Foster Wallace tome, but so many words, so many footnotes. And every so often, Rich would stand in front of the bookshelf, and ask for a recommendation. And every time, whether he wanted something funny, clever, or serious, I would suggest the Tom Robbins’ epic Jitterbug Perfume. It took about six years, but a few weeks ago, Rich picked up Jitterbug, and he couldn’t put it down. Last Friday night, I turned to him and said “babe, it’s 1:30AM, it’s time for bed.” He had been captured by the best kind of hostage taker: a great book. 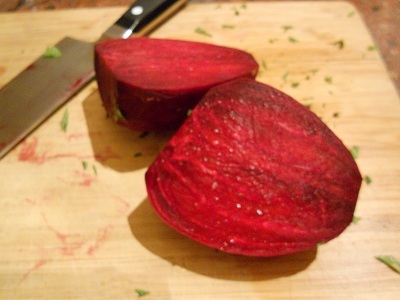 I had been gearing up for a beet-tinged Valentine’s Day post. Well, we don’t exactly celebrate Valentine’s Day. 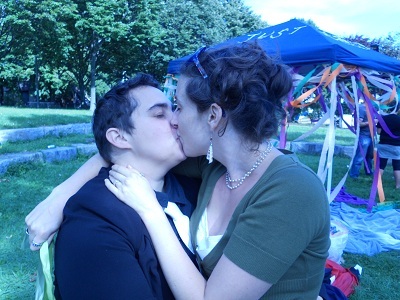 As it happens, we met on February 11, so we celebrate that day instead. It also makes it easier to get a table for our romantic date. This year we went to a French restaurant which will remain nameless. It was a decent meal, but the chocolate souffle was so bad that they comped both it and Rich’s Chimay. That, plus our coupon, made for a very reasonable meal. As I was saying, for my Valentine’s Day post, I had been thinking about the beet, with its juice that stains everything the color of love. And when I said to Rich, I’m thinking of doing a beet post this year for Valentine’s Day, he looked up from his book and said, “If you’re talking about beets, make sure to mention Jitterbug Perfume.” And he specifically mentioned this dish, which comes out a very Valentine’s Day color. He couldn’t have been more romantic if he tried. This recipe is incredibly easy because it employs my favorite kitchen tool, the pressure cooker. Simply peel the beet and cut off its roots. Shred it in the food processor. Cook the risotto according to your pressure cooker’s instructions. 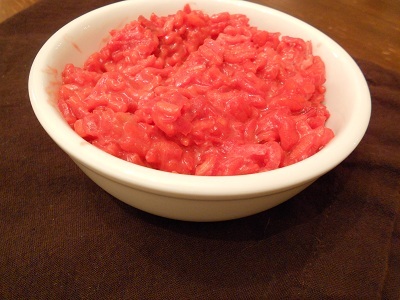 After you add the rice, but before you add the stock, add the shredded beets, and continue with the recipe. When your risotto has cooked under pressure (mine takes about 7 minutes) replace the called for parmesan cheese with the same amount of goat cheese. It’s just that easy. I have a problem. I don’t know if it’s treatable, or if it’s just one of those lifelong maladies. When I am at a function — bar mitzvah, wedding, food blogger’s cocktail hour — I lose all sense of control and eat until I’m food-drunk. Literally, intoxicated. 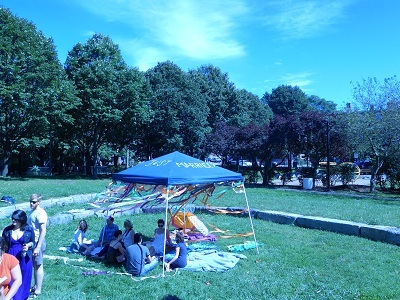 We once went to the Phantom Gourmet block party, and a few hours in, Rich found me stumbling around Landsdowne Street, Zeppy’s bagel in my left hand, and a chunk of chocolate in my right. I still don’t remember how we got home. 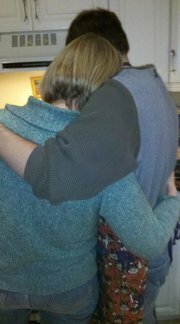 This is all by way of explaining why I have no pictures to show you from Beyond Bubbe’s Kitchen on Sunday night. Oh, I brought my camera, and even the tripod. But how can I take photos of food AND eat it at the same time? Words will have to suffice. First, there was moist brisket, crowned with onion confit and a sprinkling of pomegranate seeds, cooked by Julio de Haro of Estragon. But I had to hustle, because rumor was Erwin Ramos from Ole! was about to run out of chocolate tamales! (Not to worry, they brought strawberry tamales as a back-up — vanilla custard sauce, people!) I may have had more than one bowlful of Tony Maws’ from Craigie on Main’s kasha varnishkes with homemade pasta and duck confit. Have I mentioned Michael Leviton of Lumiere‘s sweet, yet savory, Purim-inspired poppy seed “Oreo” cookies with poppy seed filling, which were served with a Bourbon-spiked milkshake? No? Oops, because I had three. Somehow, I managed to stay lucid enough to meet Jewish cookbook writer extraordinaire Joan Nathan. But a funny thing happens to me when I am around certain cookbook authors. They are my version of rock stars, so I get really nervous, a bit giddy, and start talking really fast. Honestly, put me in a room with any of this year’s Oscar nominees, I’d be as cool as a bourbon-spiked milk shake, but put me near a cookbook author who has a section in my cookbook collection, and I’m a puddle. God help me if I’m ever near Mollie Katzen or Deborah Madison. This fall I met Mark Bittman, and I’m still not 100% sure what I babbled at him. The recipes I have here, homemade ricotta and pickled beet salad, are from Jeremy Sewall of the Eastern Standard — sort of. His recipes were a bit sparse — Hemingwayesque, really — so I’ve added more detailed directions. 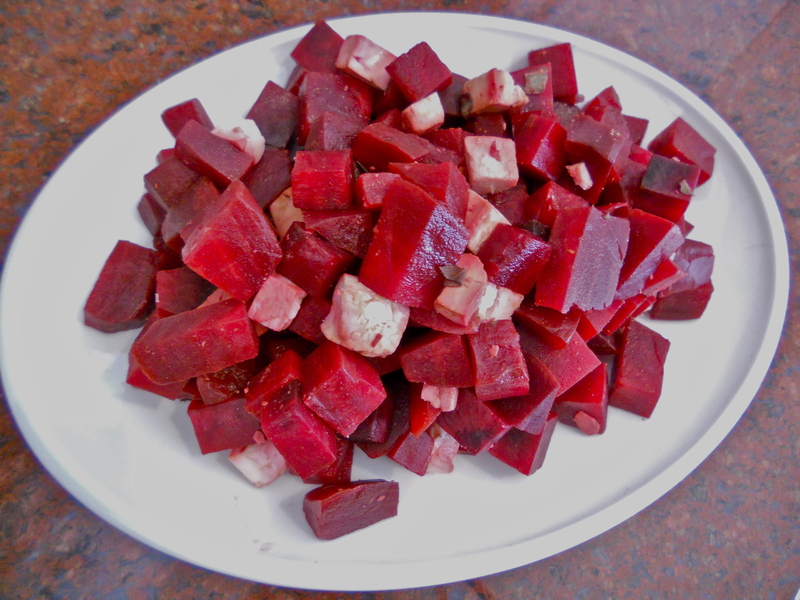 Also, I couldn’t help but modify the beets for my favorite kitchen companion, the pressure cooker. Cheesecloth — The regular grocery store on the corner sells this, I promise. If you can’t find it, just ask. While the milk is heating, line the colander, which should be sitting in your sink, with a double layer of cheesecloth. 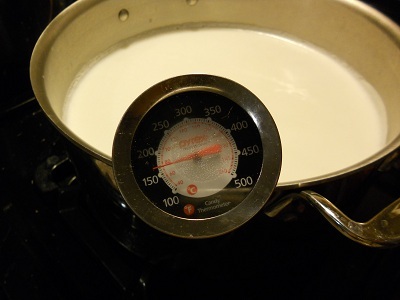 When the milk reaches 175 degrees ( a gentle simmer) add the fresh lemon juice, and stir gently with your wooden spoon. Then, the most magical thing happens: curds and whey begin to separate in the pot. This should take no more than 10 minutes. 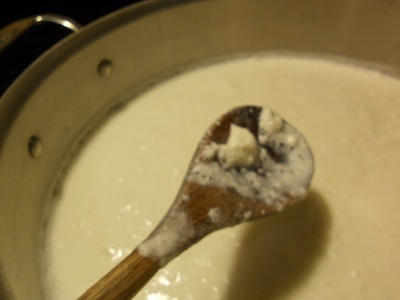 Next, take your pot over to your colander and spoon the curds and whey into the awaiting cheesecloth. Do not pour it, as that will destroy the delicate curds. 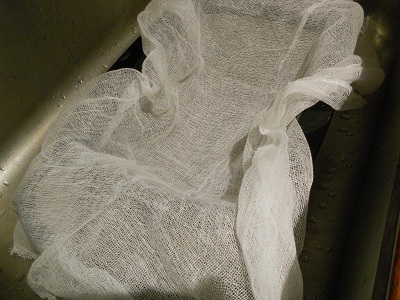 Gently fold up the corners of the cheesecloth, and tie them up with the twine. DO NOT SQUEEZE. 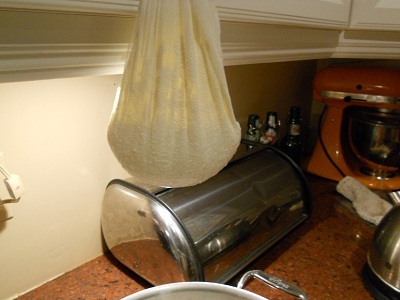 If possible, hang the cheesecloth above the pot as the whey drains. 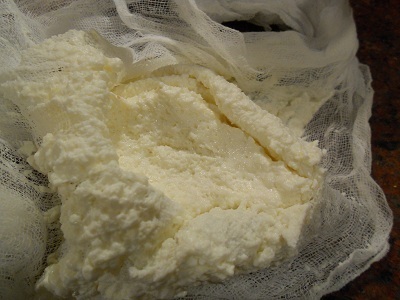 In two hours, cut the twine, open up the cheesecloth, and gaze at your homemade, pillowy clouds of fresh ricotta. 1 large beet, peeled, washed, stem and root removed. Equal parts sherry vinegar and water, to one-half part sugar. Place all ingredients in a small pan that is large enough to hold the whole beet. Cover with foil and braise in oven until you can pierce through the beet with a paring knife; it should take between 60 – 80 minutes. Sewall serves his salad with segments of a blood orange. I did not have any on hand, but if you do, I am sure it would taste delicious. Shabbos dinner somehow grew from just me and Rich to three guests at our table Friday night. 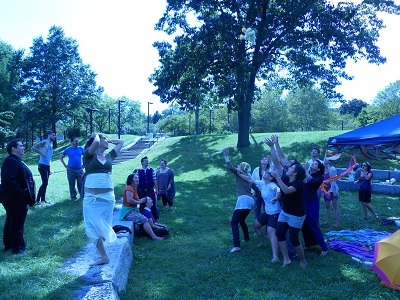 In my fridge I had three beets, a head of cabbage, five mushrooms, and a block of feta. We feasted. I was very silly and didn’t take photos of our food before we supped, so what I have here are leftovers — hooray for leftovers! 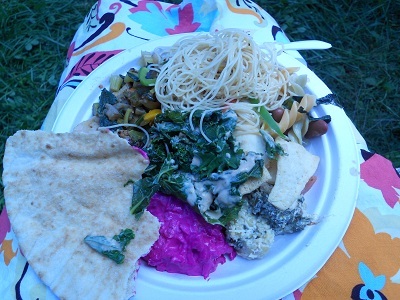 I have no shots of the cabbage and mushrooms, which turned out to be the hit of the night. I didn’t do anything special to them — just sauteed up an onion for a good long time until it began to caramelize, tossed in some garlic, then the mushrooms, then the cabbage. Right before I took it off the flame I added two sage leaves. All I did was cook the cabbage down until it was too exhausted to put up a fight anymore. Limp, molted green and muddy brown, it probably wouldn’t have made very pretty picture, but it tasted great. 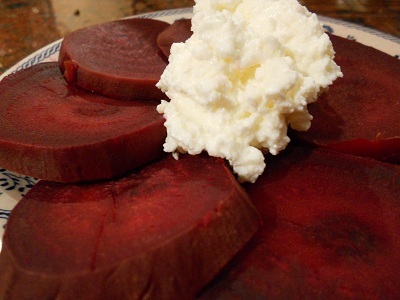 The beets took 25 minutes in the pressure cooker .A very simple dish: I cubed the beets, and half a block of feta, then drizzled balsamic vinegar and sprinkled fresh mint (from my container plants outside) on top. 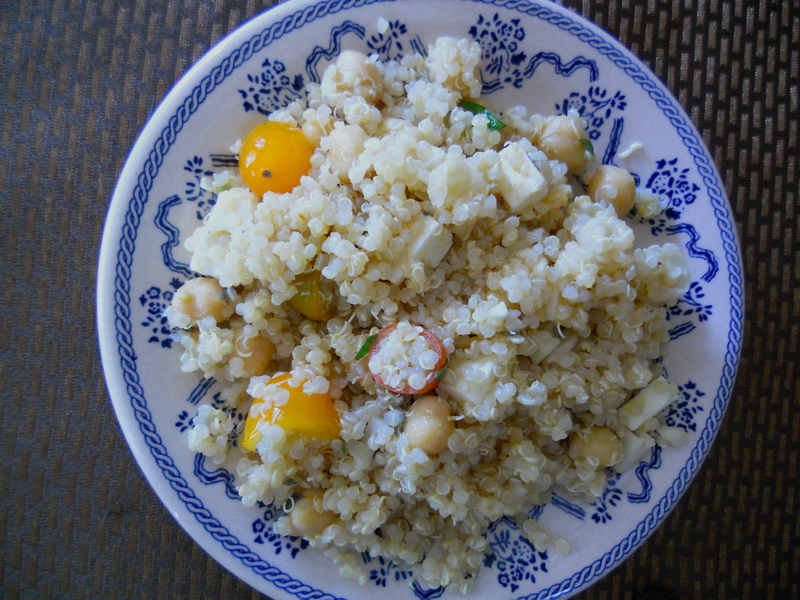 I used the other half of feta for the quinoa, chickpea, and farmers’ market tomato salad. I cooked the chickpeas in the pressure cooker for 11 minutes with some bay leaves, a teaspoon or so of whole black peppercorns and two cloves of garlic, unpeeled. 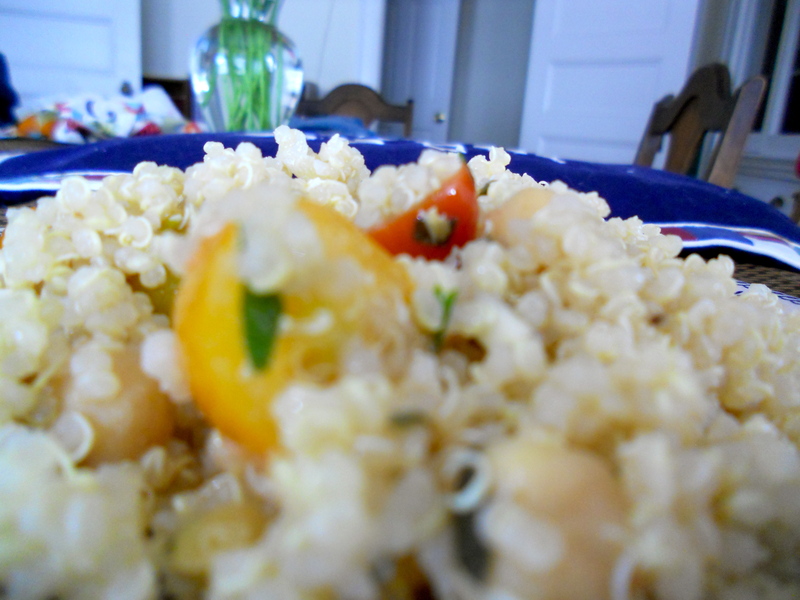 While that was going on, I cooked the quinoa in my rice cooker — no muss, no fuss. Quinoa is a great pantry staple: protein, carbs, fat, calcium, you can get a pound of it for less than $4 in bulk at Harvest Co-op. As for feta, here’s a tip: If you go the Market Basket in Somerville — which, by the way, has FANTASTIC produce at the some of the best prices in town — head over to the deli counter. On the right hand side up against the wall is a counter fridge. Inside you’ll likely find huge blocks of really decent feta for about $4. I put all these together in a glass jar, and shook. That’s all. This is basically the blue print for all my dressings. Make sure to let the quinoa cool down before you dress it. Otherwise it will soak up everything and you’ll be wondering where all your flavor went. I speak from experience! Quinoa salad on one of my new plates... thanks Freecycle!